People used to iPods were fairly miffed when they discovered there would be no access to the file system on the iPhone – at least for the time being – but thankfully Ecamm Netork's iPhoneDrive sorts this oversight for just $9.95. 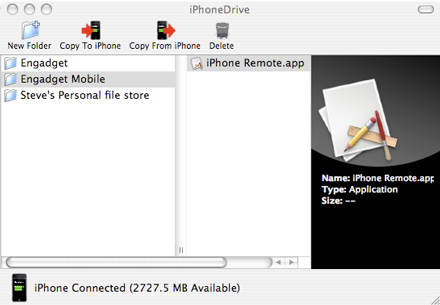 iPhoneDrive is a really basic tool, no muss, no fuss, just plug your iPhone into your Mac – no Windows version yet friends -- start iPhoneDrive and presto change-o, a gui opens for adding files to your iPhone. Read on, and we'll show you what all the fuss is about. When the app first fires up you are presented with a clean slate, keep in mind, we are only using the iPhone for storage, this bit of wizardry doesn't get you anywhere near the actual inner workings of the handset. Menus buttons are basic, create folders, copy files to and from the handset, and delete what is no longer needed. A display on the bottom of the application pane shows connection status and how much space you have remaining for storage. Click the left pane, use the toolbar to create a folder or two, and then add whatever you like to your new storage device. Adding files to and copying from the iPhone is straightforward and only involves hitting the appropriate button and following the prompts or dragging to and from the finder window. 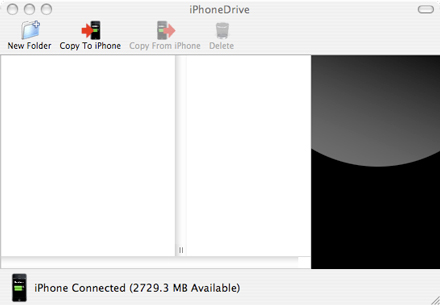 As an added bonus, iPhoneDrive works perfectly well with "Hacktivated" iPhones, even those originally set up on the Windows platform. We weren't sure if restoring the iPhone would blow away all of our files, and weren't too thrilled to give it a shot. This is a fine, simple tool, and it works exactly as advertised: it converts your iPhone into a memory key, nothing more or less. It would be really sweet if we could get at our music, videos, SIM unlock, and the file system with this software, but alas, we will likely have to look elsewhere for that functionality. While we recognize that Ecamm deserves minor applause for getting this to market quickly, and there there is obviously a need for it, we just wish that Apple had included this functionality out of the box. Either way, we are happy to take what we can get but do hope to see more features in future upgrades.